In today’s world, families are experiencing deep changes and new life patterns are emerging. #wearefamilies is an animated docu serie and a cross-media plan that examines parenting and explores new emerging family type in a playful and instructive way. With the animated serie, we follow Camille and Lysa who are in love and dream of having a child of their own. ART, IVF, surrogacy, gay parenting, co-parenting, adoption … They decide to explore all the possibilities to help them realize their dream. In their quest, they lead us through what is, nowadays, a not uncommon experience for those couples who do not fit into the traditional concept of family. It is a sensitive and contemporary story of a common quest for maternity which brings us on a journey through the changing patterns of society in today’s world. Caroline Fournier is a scenarist and director. Passionnate about cinema, graphism and interactive writing, she is pursuing a double cursus in cinema and hypermedia at Paris 8. Her first two short films are shown in many international film festivals. Born from her encounter with Julie Demay and Cécile Vargaftig, she has then realised one full-length movie in collaboration with Brigitte Fontaine, “We Will Not Go In Tokyo”, a musical drama. Since that, she has realised another short film named “A little chinese dress”, also shown in various film festivals and brought by OCS. At present time, she has two short films in production with Eduardo Sosa Soria from Vagabundo. 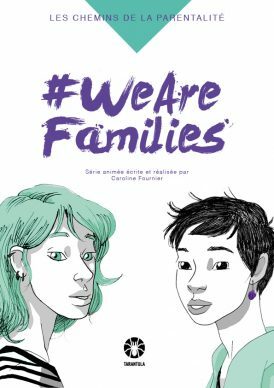 She is also working on several projects that have innovative writing : #wearefamilies ( grant Brouillon d’un rêve 2016) produced by Elise André from Tarantula and supported by le Film Fund & 3 soeurs, a 360° video movie (laureate Learn Do Share from Paris).